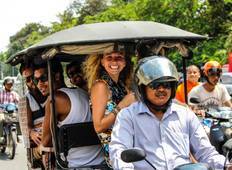 Find the right tour for you through Koh Rong Sanloem. We've got 17 tours going to Koh Rong Sanloem, starting from just 8 days in length, and the longest tour is 37 days. The most popular month to go is November, which has the most number of tour departures. "I enjoyed the river activity at Arcadia the most and visiting the beautiful Koh Rong..."
"What an incredible 10days of travelling!!! Just finished and would do it all over..."
"I’ve done a lot of solo traveling previously and this was my first ever organised..."
"BEST EXPERIENCE OF MY LIFE.! ninh binh was my favorite in Vietnam beautiful views..."